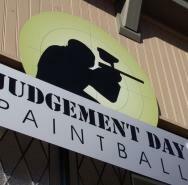 Judgement Day Paintball is a full-service paintball store with the area's largest selection of paintballs, markers, gear and accessories from novice to elite. Come see us for great brands, competitive prices and easy HPA or CO2 tanks refills, all in one convenient location. Visit our retail store for an excellent selection of refurbished markers at outstanding prices. Our playing field in Delhi is now open and available by reservation. Book your play times today!